While he can still recall his first-ever drive of an A-Class model on the stunning country roads of Austria, in 1997, Iain Robertson believes that the latest version is not quite on the mark, let alone right for market. There was an immense amount of negative publicity that arose from a hapless Swedish car magazine rolling over a first generation A-Class, in a vain attempt to check its performance in the now infamous ‘Elk Avoidance Test’. I continue to believe that the stars were clearly not in alignment. I had driven various new examples at its 1997 vehicle launch and none felt in the least ‘topply’. In fact, I quite enjoyed the driving experience. It was involving. Yet, Mercedes-Benz reacted with knee-jerk force, in the process costing itself several million Euros, to resolve the situation. The cars I drove subsequent to that launch, bearing in mind that a major recall also occurred to install (both retrospectively and expensively) vehicle stability software on all models already delivered to customers (including factory and dealer stocks), were so numb in their handling responses and so ‘safe’ that there was no earthly way that Merc’s good name would ever be drawn into disrepute…unless you were an enthusiast, wishing to enjoy some close-to-the-edge driving moments. Of course, there were other factions in play at the time. Not the least came from the EC, which was busy churning out demands to the motor industry, to make their cars ‘safer’ and ‘less involving’ for drivers. ESP, or Electronic Stability Program, was about to be rolled out (if you can pardon the unfortunate pun) to all carmakers and Merc, which had been in the foreground of the development, simply could not be perceived as having committed the ultimate fail. Yet, I loved that pre-modified A-Class. It was lively, involving and affordable, meaning that a Merc product could be in a suburban driveway for little more than a £14k consideration. That was a ‘first’. However, the A-Class was crammed full of ‘firsts’. For a start, its unique aluminium sandwich platform, within which most of the car’s ancillaries would be protected, also ensured that the A-Class could boast a significantly lower centre-of-gravity than any of its rivals. In my book, that pooh-poohed any suggestions of its instability…there were plenty of other new models, at the time, that were significantly less stable than it was. The resultant, near-flat cabin floor, allied to the one-box body design, meant unrivalled interior space and great access for four (plus one) adults. Even today, there are very few new cars into which I can install my two metres of height and be hopeful of enjoying a superbly comfortable and supportive driving position. In the A-Class, I could stretch out and luxuriate. It was the consummate good automotive design. Sensible. Logical. Ideal. With the second generation, apart from adding a three-door variant to the range, largely because ESP was now almost a de rigueur fitment to every new car sold in Europe, the worst effects of ‘first-gen’ software were obviated. There was less likelihood of the orange warning triangle illuminating in mid-bend, or overtaking, manoeuvres, which was more than a slight annoyance factor in the modified Mark Ones. In fact, retaining the alloy sandwich for the Mark Twos also gave Merc the opportunity to make the model sit more planted on the road, by gifting it a wider track and somewhat more aggressive chassis dynamics. It worked and the company was even able to joke (unusual for the Germans, normally) about its ‘Elk Survival Program’. You can perceive the jest for yourself. Once again, I fell in love with the A-Class, even though it was now somewhat pricier than its progenitor, although every single aspect of its build had been improved, or enhanced, to significantly higher levels. It warranted its ‘Three-Pointed-Star’. I just wish that I could say the same for the latest variant, which is altogether more conventional and notably less expensive to manufacture than before. However, I feel strongly that Merc, in a state of denial, has not done the right thing with this model. The sandwich platform gave it a market lead that would still be relevant today. It also meant that its hip height made access easier for occupants of all ages, not least people aged over fifty years, or mums with children in attendance. Of course, justifying its market position is what Merc is now trying to achieve. An entire raft of other models is also based on the same, conventional platform, from the A-Class hatch, to the saloon (with its droopy and not very attractive tail-end) and even the GLA soft-roader. To be fair, spreading the load means that unit costs come down, while profitability levels take an upwards hike and, following a number of less-than-fruitful years in its car division, Merc needs to pursue that option, rather than appealing to the lovers of Merc quirkiness and individuality. Look, I am not saying that the latest A-Class is a duffer, because it is not. It is simply that, from some angles, it looks more like a BMW than a Merc and, from others, it might even pass for Astra hatchery, rather than Merc mastery. Fear is a terrible aspect to become subordinated to but it is more than abundantly clear that Merc has decided that conforming is better than confirming. The model I have been driving is known as the A200CDi AMG. While I quite like the grumbly 1.8-litre turbo-diesel four-pot beneath its bonnet, it is not exactly the most refined of motors on the block, although there is no denying its excellent power delivery, even though it only produces a modest 136bhp. The reason lies in its strong torque delivery, which helps to accelerate the car from 0-60mph in a very respectable 9.0 seconds, with autobahn gearing taking it on to a top speed of 130mph. Its Official Combined fuel figure (62.8mpg) is not reflected in the actual attained return of 48.2mpg, after a week’s worth of punting around town, with a couple of longer drives for good measure. Despite trying hard, it was difficult to squeeze much more than 50mpg from the car. However, the other elements related to ‘hard’ include the ride quality, which, thanks to its ‘re-engineering’ carried out by Messrs Aufrecht, Melcher and Grossaspach, the AMG that stands for the firm’s sporting division, is just too firm for regular daily existence. As a result, mid-corner bumps jounce the car off-line, sometimes unnervingly, while not slowing to a crawl for ‘sleeping policemen’ might eventually result in severe spinal injury for the driver, if repeated too frequently. 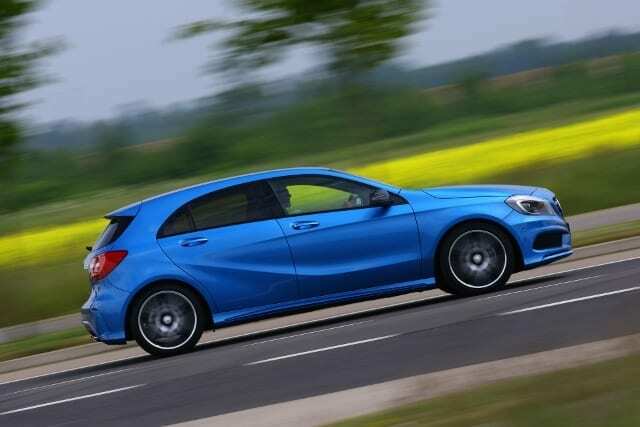 If anything, the new A-Class’s handling is not as refined as the earliest versions of the car. The six-speed manual transmission is certainly slick enough, which must help with extracting the best overall performance from the A-Class. Of course, the model offers a myriad of engine and transmission choices, the 1.8-litre version tested is conveniently mid-range and the most popular choice of both private and company car purchasers. However, its 121g/km CO2 rating is £110, an aspect not helped by the 18-inch diameter AMG alloy wheels, which bump up the emissions and, thus, the tax implication. Carrying a price tag of £34,430 is unsurprising, as the test car was also carrying a heap of extra-cost items in its specification, to hike up the price tag from a more reasonable £25,110. As with all of its Germanic rivals, the buyer is confronted by a base price and a long list of options. If you want to avoid paying over the odds, either argue for a better up-front discount, or be very careful when ticking boxes. To be fair, Merc menu maintenance is very reasonably priced and can make Audi, or BMW, ownership look conspicuously costly. Overall, the new Mercedes-Benz A-Class possesses a strong on-road presence and the ‘three-pointed’ symbol remains a core attraction. It is well-built, although some elements of the trim (including the faux leather upholstery) provide a less enduring impression of quality. The car is outstandingly safe, with a plethora of ‘life-saving’ acronyms to keep brochure-browsers happy for ages. Although I believe that there are better cars in this class, if a Merc A-Class floats your boat, then there is enough to maintain interest levels here.